Whenever summertime comes to the south of Mars, the days grow longer and warmer. This is not good news, however — and the reason why can be given in a single word: dust. 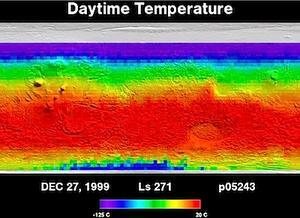 Scientists at Arizona State University's Mars Space Flight Facility use the Thermal Emission Imaging System (THEMIS) on NASA's Mars Odyssey orbiter to detect seasonal and yearly changes in the amount of dust veiling the Red Planet's atmosphere. THEMIS is a multiband camera that works at 9 infrared wavelengths and 5 visual ones. The scientists use an algorithm that estimates the dust opacity at an infrared wavelength of 9 micrometers. The most recent THEMIS dust maps are at right (latest at top; click to enlarge). Dust maps are also available going back farther that display the lower part of the dust range with enhanced sensitivity. (This magnifies the amount of activity, making it easier to see when activity is less.) The accompanying data coverage figures show where individual THEMIS dust measurements have been made; the dust maps are extrapolations from these. 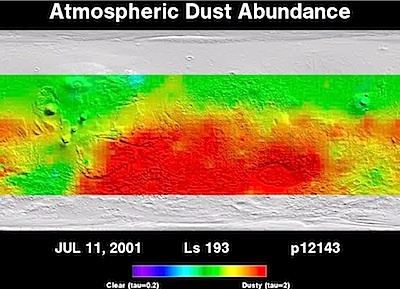 Below the current dust maps at right are movies made with an earlier instrument, the Thermal Emission Spectrometer (TES) on NASA's Mars Global Surveyor orbiter (1996-2006). Data from TES overlapped in time with THEMIS, which let scientists calibrate THEMIS as a dust monitor. "Dust storms on Mars are driven by solar heat," explains Philip Christensen, Regents' professor of geological sciences and the THEMIS camera's designer and principal investigator. "Like winds on any planet, air flows from where it's warm to where it's colder." 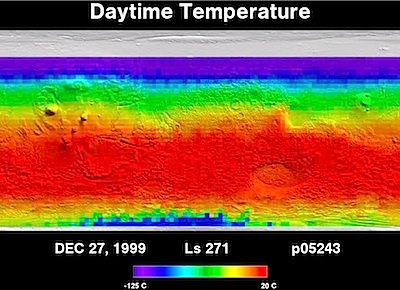 For more than a billion years, Mars has lacked oceans or other large bodies of liquid water to trap windblown sediments. As a result, the entire Martian surface is dusty, with very few places completely bare of it for long. This provides ample fine material for winds to lift into the air. "Mars travels in a very elliptical orbit," Christensen says. "And it's closest to the Sun at the time of southern summer. That's when the heating is greatest, the winds are strongest, and traditionally, that's when the big global dust storms occur." He adds, however, that atmospheric activity also includes regional dust storms that erupt throughout the Martian year. "It's not like there's no dust activity outside of southern summer." Dust storms on Mars, which occur on local, regional, and global scales, dwarf anything seen on Earth. On Mars a "local" storm means one that's the size of Arizona, and a regional storm could cover the entire United States. Dust kicked aloft by winds affects operations for all spacecraft working at Mars. The fleet includes two NASA rovers on the ground (Curiosity and Opportunity), plus four orbiters, three of which belong to NASA (Mars Odyssey, Mars Reconnaissance Orbiter, and MAVEN) and one from the European Space Agency (Mars Express). Christensen says that scientists have a couple of options when dust activity grows. ”The main thing we do is look at past activity to identify the places most likely to be dusty, and then just not image there. And make a note not to send future rovers to that place." Moreover, he adds, "during hazy periods, we take fewer images at visual wavelengths and more infrared because they are less sensitive to the dust." Over the years since 2002 that THEMIS has operated at Mars, data from it and its predecessors, plus instruments on other spacecraft, have increased scientists' knowledge of how dust storms grow and develop. Explains Christensen, "People used to think there's just one source region and it blew dust all around the planet. But we have a better picture now." Activity might start in Hellas, he says, "a large, deep impact basin in the Southern Hemisphere containing loads of dust. Again and again, dust activity would migrate out — then die. Eventually, though, dust starts drifting around the planet, and a week later we'll see four, five, or six of these major regional storms popping off." A major goal for scientists is to understand how the storms originate. "There are some ideas," says Christensen. "One idea is that there's feedback going on. One year you have a big storm and lots of dust eventually falls out onto the surface. This brightens the ground so that next year it doesn't get as hot, and thus it doesn't generate as much wind. It takes a while for the dust to blow away and leave a dark surface. But when that finally happens, the surface gets really hot, and then, boom, you get a big storm again." He admits, "It's hard to prove this idea or disprove it, but it's rare to have two global storms in two successive Mars years. So the prediction is that if one year is a bad year, then the next year won't be as bad." In the big picture, he says, it's interesting that Mars seems to remain right at the threshold of triggering global storms. Mars dust isn't like most Earth dust; the particles are much smaller. "Even talcum powder is about six times larger than the average Mars dust particle," explains Christensen. "If you think about it, however, that makes sense because the dust can hang around in a really thin atmosphere, only one percent as dense as Earth's." The dust is also telling us something about Mars' climate history, Christensen says, because there ought to be even more of it than scientists find. "There's a good question why Mars isn't a billiard-ball planet covered by a kilometer of dust," he says. ”Well, maybe throughout most of its history, Mars has had too thin an atmosphere to make dust or initiate saltation or wind abrasion. No dust devils, no storms." In this scenario, Christensen says, maybe the atmosphere cycles in and out. "At the top of the cycle — like now — perhaps there's enough atmosphere that dust erosion activity can operate. But over geologic time, the atmosphere stays mostly in a regime where nothing happens." If you take our best guess as to how much dust is being created now, he says, "and you multiply that times 4.5 billion years, you get 100 meters of dust covering everywhere on the planet." But, he concludes, "If Mars is actively making dust only 2% of the time, you'd get 2 meters of dust — and well, that's about right."